Windsport hosted a day’s viewing from their “fast rib” on the first day of the J Class regatta taking place Falmouth Cornwall. The four J Class Yachts present gave all the spectators some amazing scenes as they crossed the start line and powered away to the first windward mark. 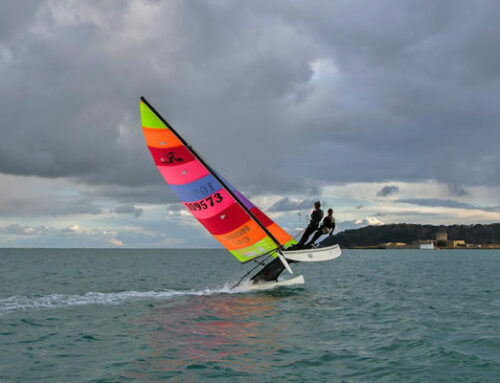 Guests onboard the Windsport rib could see at close quarters the amount of man-power and team work involved in sailing one of these stylish 140 foot yachts. After nearly 4 hours racing on the finish line some of the yachts were only boat lengths apart. It is a spectacle that is rarely seen with these breathtaking boats competing in close proximity and with capable and experienced rib handling you can get in close to see what many people regard as being the ‘the greatest class of yachts ever created’. Windsport charter their ribs and qualified powerboat drivers for film, television, promotional and corporate activities as well as use them for regatta coaching support.